Treat injuries to the shoulder and elbow with this combination shoulder/elbow cold therapy system. Pitchers who want to extend their baseball careers can benefit by icing immediately after leaving the field with this portable, easy-to-use system that can be applied right at the field of play. But Pro Ices shoulder/elbow wrapas with all Pro Ice productshas use around the home and workplace for those with rotator cuff injuries, bursitis, golfers elbow, tennis elbow or any sort of repetitive stress injury. 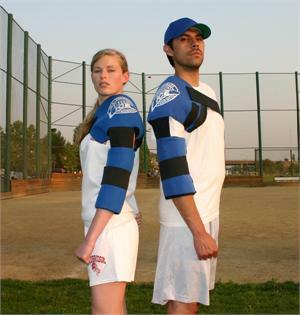 The shoulder/elbow cold therapy unit covers the rotator cuff, upper arm and elbow. Ice is a proven, non-toxic pain reliever for acute injuries, such as shoulder and elbow strains that come on the job, sports or hobbies, or following surgery. Simply place this reusable cold pack around the shoulder and elbow. The windowpane format will conform to the body and the compression straps will boost the benefits of the cold therapy unit. The single ice insert will maintain a consistent temperature for an hour; extend the pain relief by adding the PI 201, shoulder/elbow ice insert, to your order. Once youve received your PI 200, place the ice insert in your home freezer for a few hours, laying it flat if possible. You may freeze the insert inside the wrap or on its own. Then, simply apply the cold therapy wrap to your body and continue your daily activities. The ease and convenience of Pro Ice means there will be no drips and no need to rest while you ice. Take the ice where you need it with the Adult Pitcher's Kit. 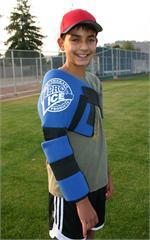 Be ready whenever you need icing with the shoulder/elbow wrap, cooler bag and extra ice insert. Provides hours of superior, convenient cold therapy.